It has come to my attention (I love how God does this) that I need to get back into memorizing scripture. For many years, I was very committed to memorizing God’s word and etching it onto my heart. I loved it because I suddenly started to hear God talking to me much more often and a lot more clearly. He stills does this today. When I need to hear his voice and I don’t have a Bible close at hand, he reminds me of a scripture that I have memorized. He talks to me like this all of the time. And it’s obviously time for me to get more of His word written on my heart. Several years ago I decided I wanted to memorize James 1 but I didn’t get very far. I love this portion of scripture because it starts with “Consider it pure joy” . God talks to us in this passage about how to be more wise and how to deal with trials. He also tells us that every good and perfect gift is from him, the Father of the Heavenly Lights. My life could use some more of his heavenly light – how about yours? Would you like to hear God speak to you more often? More clearly? Writing his words on your heart is a tried and true method of improving your communications with God. Let’s start small. This is a marathon, not a sprint. I’m not planning on posting these to Facebook so, if you want to take this ‘sword fighting class’ with me, make sure you sign up as a follower of my blog so you receive the emails. There’s no time like the present – here we go! James is actually a letter so it begins with greetings and salutations. We’ll start with the good stuff – verse 2. 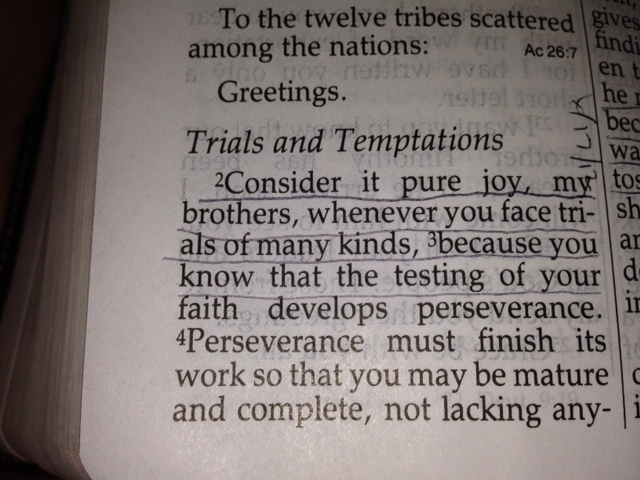 James 1:2 Consider it pure joy, my brothers (and sisters), whenever you face trials of many kinds, because you know that the testing of your faith develops perseverance. Note: As I memorize these, I add words such as “and sisters” above. God told me it’s ok :). He is also speaking to women and adding these words helps make it more personal for me. Your choice. Say this verse 3 or 4 times a day and you’ll have it written on your heart by next week. Then we’ll add the next one. God’s direction on how to become more wise is coming up! Nice idea. Might have to give this a go. Please memorize this with us – it’s a great section of God’s word. And we know for certain that God will help us do this because it is in his will for us to etch his words on our hearts. One verse at a time. We can do this!